13 eClean Magazine applicator," Kooker explained. "Unlike many of our competitors, all we specialize in is hardscape products and our products are still manufactured right here in Pompano Beach, Florida, just like they were when we opened in 1950." Although many of the company's original products are still available – such as the top selling Cobble Coat and Coloron solvent- based sealers – SurfaceLogix has expanded their product line to include a wide range of environmentally-friendly and low-VOC products. Examples include the water-based Cobble Loc family of products and selection of eco-friendly cleaning and maintenance products. 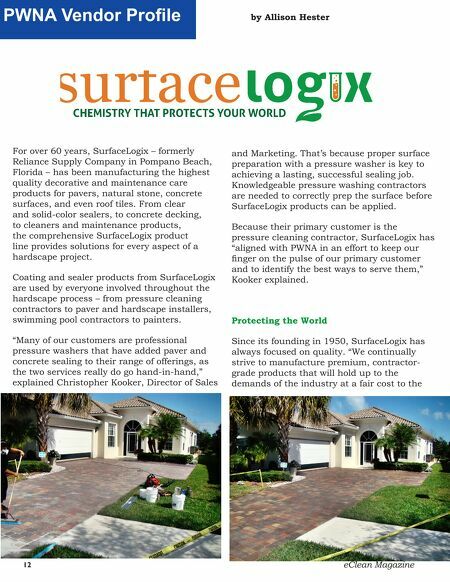 This is all part of the recent SurfaceLogix rebranding effort, which is "based on what we're passionate about – Chemistry that Protects Our World," Kooker explained. "The rebranding not only brought with it a name change, but new product labeling, design and a website with online shopping capabilities, refreshing our look and making it more current." Comprehensive Customer Service In addition to protecting the environment, SurfaceLogix is also dedicated to providing comprehensive customer support. 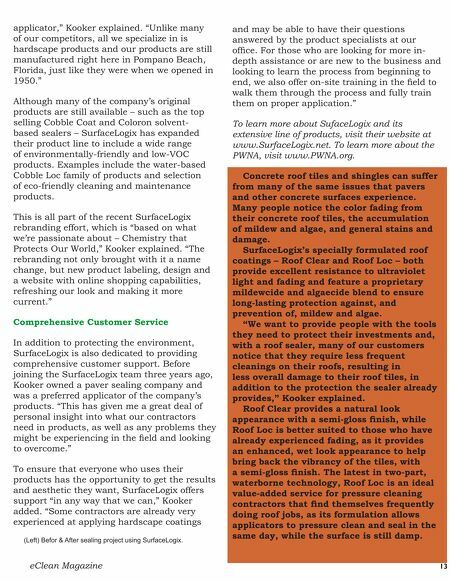 Before joining the SurfaceLogix team three years ago, Kooker owned a paver sealing company and was a preferred applicator of the company's products. "This has given me a great deal of personal insight into what our contractors need in products, as well as any problems they might be experiencing in the field and looking to overcome." To ensure that everyone who uses their products has the opportunity to get the results and aesthetic they want, SurfaceLogix offers support "in any way that we can," Kooker added. "Some contractors are already very experienced at applying hardscape coatings and may be able to have their questions answered by the product specialists at our office. For those who are looking for more in- depth assistance or are new to the business and looking to learn the process from beginning to end, we also offer on-site training in the field to walk them through the process and fully train them on proper application." To learn more about SufaceLogix and its extensive line of products, visit their website at www.SurfaceLogix.net. To learn more about the PWNA, visit www.PWNA.org. Concrete roof tiles and shingles can suffer from many of the same issues that pavers and other concrete surfaces experience. Many people notice the color fading from their concrete roof tiles, the accumulation of mildew and algae, and general stains and damage. SurfaceLogix's specially formulated roof coatings – Roof Clear and Roof Loc – both provide excellent resistance to ultraviolet light and fading and feature a proprietary mildewcide and algaecide blend to ensure long-lasting protection against, and prevention of, mildew and algae. "We want to provide people with the tools they need to protect their investments and, with a roof sealer, many of our customers notice that they require less frequent cleanings on their roofs, resulting in less overall damage to their roof tiles, in addition to the protection the sealer already provides," Kooker explained. Roof Clear provides a natural look appearance with a semi-gloss finish, while Roof Loc is better suited to those who have already experienced fading, as it provides an enhanced, wet look appearance to help bring back the vibrancy of the tiles, with a semi-gloss finish. The latest in two-part, waterborne technology, Roof Loc is an ideal value-added service for pressure cleaning contractors that find themselves frequently doing roof jobs, as its formulation allows applicators to pressure clean and seal in the same day, while the surface is still damp. (Left) Befor & After sealing project using SurfaceLogix.